ST. PETERSBURG — A project that a developer labeled "an experiment in enlightened capitalism" got the green light from the City Council on Thursday. The Orange Belt Station project promises to bring a craft distillery and, perhaps, an alternative weekly newspaper to the Warehouse Arts District. The council also received updates on the Manhattan Casino negotiations and Commerce Park project along 22nd Street S, known as "The Deuces," which have divided the black community and become a major issue in the mayoral race between incumbent Mayor Rick Kriseman and former Mayor Rick Baker. Howard and Lucinda Johnston are spearheading the Orange Belt development, which would create a craft distillery run by their son, Chris Dixon. The site at 600 26th St. S would include space for artists' lofts and galleries and office space for what the Johnstons hope will be occupied by Creative Loafing, the alternative newspaper. The Johnstons said they wanted to nurture struggling artists and businesses and would exercise "voluntary rent control." The Orange Belt project was the first of three potential developments south of Central Avenue that have rankled some, but are supported by Kriseman as spark plugs for revitalizing the poor and predominantly black neighborhoods in Midtown, a key voting battleground. Deputy Mayor Kanika Tomalin said all three proposals will create at least 100 jobs. "We celebrate this. We're proud of this. We're nowhere near done," Tomalin said. "The onus is on us as stewards of our resources to make sure these people deliver on their promises." The projects were criticized by former mayoral candidate Theresa "Momma Tee" Lassiter for being the latest example of gentrification in Midtown at the expense of the black community. "This means war," said Lassiter, who said she had gathered hundreds of signatures of residents opposed to the mayor's plan to put a Floribbean restaurant in the Manhattan Casino at 642 22nd St S.
The Orange Belt deal with the city grants a 25-year lease of the city-owned property, a former brownfields site, at $1,200 a month. The Johnstons and city real estate officials said they expect to eventually buy the property for the $185,000 appraised price. Council member Ed Montanari said he thought that was a sweetheart arrangement. "I'm all for commerce, but I also want to protect this city's property," he said. "This just looks to me like we're giving this property away for $1,200 a month." The Johnstons have donated $2,500 to Kriseman's re-election campaign, although Montanari did not mention that fact. Montanari supports Baker in his bid to unseat Kriseman. Council member Karl Nurse said building on the environmentally compromised site, once occupied by Atherton Oil Co., was a good use of the land. "I'm trying to figure out what the gift is here. I think at some point you just say thank you," said Nurse, who has endorsed Kriseman. Council member Lisa Wheeler-Bowman, whose district covers the property, said it would be a good addition to the rapidly changing neighborhood. "I like the idea that no one will be priced out of this," she said. She too endorsed Kriseman. However, officials said the city wouldn't have any legal right to hold the Johnstons to their promise to practice voluntary rent control. The council approved the Orange Belt lease agreement by a 6-1 vote with Montanari opposed. Council member Charlie Gerdes did not attend the meeting. He was at a family wedding. Alan DeLisle, the city's top economic development official, also briefed the council on the progress of a 14-acre Commerce Park parcel on the west side of 22nd Street S across from the Manhattan Casino. The manufacturing and retail portions of the project are progressing faster than the workforce housing component, he said, but the constellation of business owners including a marine industry businesses and a high-end motorcycle dealership and service center have to complete their plans by May 2019, DeLisle said. "The ball is really in their court," he said. ST. PETERSBURG - From painting to pottery, there are a lot of ways to get creative in St. Petersburg. Whether you’re looking to hone your skills, or you’re just starting out, St. Pete is loaded with studios to help you reach your goals. Classes can range from 1 hour to several weeks, and vary in cost depending on medium and length of the class. 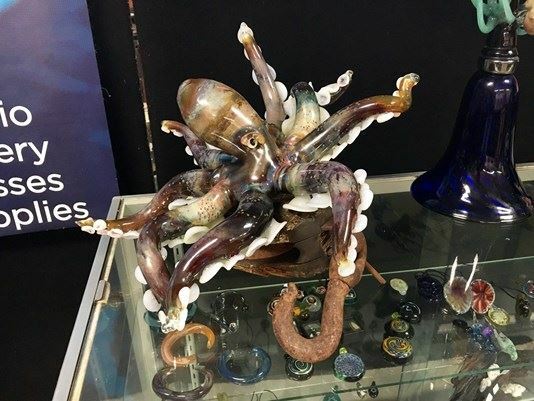 Zen Glass Studio has been around since 2002, their “Make Your Own” workshop will teach you how to make a wineglass, pint glass, glass beads or even a paperweight in just one hour. If you’re looking to take an art class, below are a few websites I found that might help you find the right studio. Mark Aeling is a master sculptor, a lifelong craftsman and, as he calls himself, a maker. His artistic practice is translating ideas into tangible, physical – and often very large – objects. 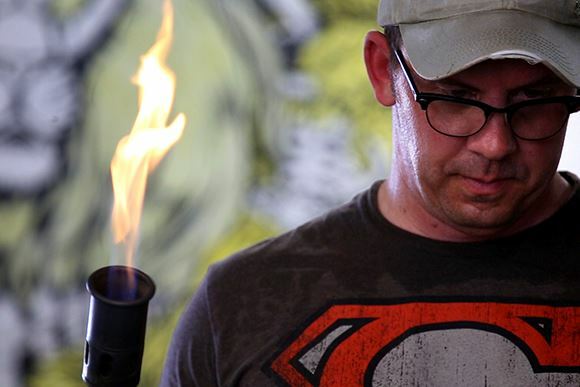 Mark’s MGA Sculpture Studio is a mainstay of St. Petersburg’s Warehouse Arts District. Through his work with the Warehouse Arts Association, Mark’s helping to create the new ArtsXchange, with affordable studio space for working artists. 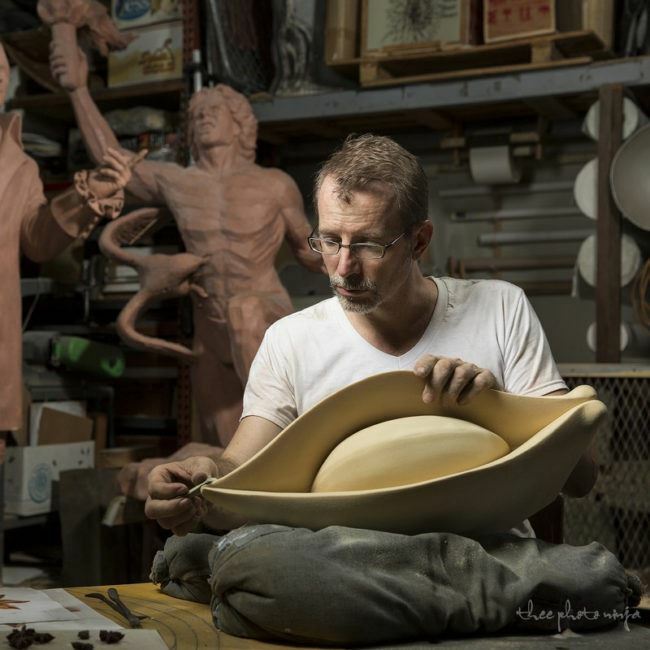 His sculptures are created in a traditional artisan studio, with apprentices learning the craft and assisting on Mark’s large-scale public art projects. He creates works inspired by shapes in the nature, and is adventurous in exploring new techniques. You’ll enjoy this fascinating conversation with an artist who thrives on the challenge of problem-solving and gets inspiration from constantly asking, how can I build that? The retirement of our executive director, Mary Jane Park, is just around the corner. On behalf of the organization I want to thank her for her commitment and work during her tenure with the Warehouse Arts District Association (WADA). As donors, members, and others interested in our work, we wanted to give you some information about how the Warehouse Arts District Association is moving forward. The Board of Directors has formed a Search Committee that has just begun meeting. We expect to spend the remainder of the summer developing a thorough process and to have a formal announcement/application out this fall. The Committee is comprised of Board members who have expertise in the skill areas that a new executive director will need to be successful in the position. WADA currently has on staff a Board consultant who is filling the role of interim director as well as an excellent COO who has been integrally involved with the organization since its inception. The position will be well advertised, most likely around mid-October. We would like to fill the position in January, but finding the right person is more important to us than the precise timing. We will keep you informed of our progress as the process moves forward. The chair of the Search Committee, Wendy Durand, can be reached at wendy@durandpottery.com. Should you have any questions, please do not hesitate to contact her. St. Petersburg’s Warehouse Arts District Association started with several leaps of faith. Artists who needed reasonably priced work space saw promise in abandoned warehouses and began to reclaim industrial buildings that once housed tomato and seafood packing plants, a large commercial laundry and a deserted railway station. In 2012, WADA organized as a nonprofit entity to attract artists, create jobs, interact with the community and offer educational programming. The district itself, which runs from First Avenue N to 10th Avenue S and from 16th Street to 31st Street, has become a creative corridor that includes roughly 200 artists who create paintings, sculpture, music and furniture. Still others shape works of glass, clay, wood, sand, paper and metal. The WADA calls the area “Where Art Is Made.” It encompasses part of the Deuces Live and Grand Central areas and is within an enterprise zone that the city has targeted for economic development. Public and private funds enabled WADA to purchase nearly 3 acres of land along 22nd Street S between Fifth and Sixth avenues and along the Pinellas Trail. The property, acquired in 2014, is now known as the ArtsXchange. It comprises six warehouse buildings that total more than 50,000 square feet of space. Current tenants include Dazzio Art, MGA Sculpture and Soft Water Studios. Construction is under way to convert about 11,000 square feet of additional space into nearly 30 studios that are being built on two levels inside the skin of one of the existing warehouses on the property. The studios will be self-supporting. Stabilized rents will pay for maintenance, operating and utility costs. Also included are an incubator area where artists can interact and teach each other and an event space that will offer gallery and gathering opportunities, plus a meeting area for community outreach, programming, children’s education and other events. The group of artists who have been chosen as the first tenants in the new studios should be able to move in sometime in July. WADA leaders also are working with the Deuces Live on an action plan that should bring better lighting and signage, safer walking and cycling areas and additional event and work space to the area. At the April 27 hard hat party held to show progress at the ArtsXchange, St. Petersburg Mayor Rick Kriseman announced that city staff will begin to improve lighting along the Pinellas Trail. The Warehouse Arts District Association was created because of the increasing desirability of the area, which is home to the popular 3 Daughters Brewing, Brocante Market and many other commercial enterprises. As property values escalate, so do rental rates for studios and galleries, often pushing artists out of the very neighborhoods they have helped to improve. Future plans are to create larger spaces for metal workers, sculptors, other mixedmedia artists, classrooms, and additional gallery space. WADA leadership envisions even more possibilities: performance space, a foundry, a recording studio, rehearsal areas, perhaps even a restaurant and/or microbrewery. Ideas emerge daily. During a recent tour of scientists from the University of South Florida, one suggested that new plantings along the trail could develop as edible gardens that would produce food available to anyone. Also being discussed are an increasing number of educational efforts, community marketplaces and festivals in the area. Art is good for the soul. It fuels the imagination. And increasingly throughout the Tampa Bay area, art is helping to generate tourism, economic development, and job creation. Cultural activities thrive here. In St. Petersburg, the Dali Museum, the Museum of Fine Arts, and the Chihuly Collection bring thousands of visitors to the area each year. Those guests fill hotel rooms and restaurants, pay Florida sales taxes, and sometimes find our city so desirable that they choose to move here. Numerous galleries and studios are destinations for residents and tourists alike. A short distance west from St. Petersburg’s magnificent, bustling waterfront, the Warehouse Arts District is creating even more opportunity. We call our part of the Sunshine City the area “Where Art is Made.” Buildings that often were abandoned as nearby railway use declined are being transformed into working areas for artists of many disciplines. Businesses such as craft breweries and distilleries, architecture firms, and a monthly vintage market are thriving here. A once-underutilized commercial neighborhood is becoming a desirable destination for even more small-business development in the city’s core. Artists including glass maestro Duncan McClellan and master sculptor Mark Aeling employ other artists in their studios. The Morean Center for Clay in the Historic Train Station is one of the largest working ceramic entities in the Southeast. Organized in 2012, the Warehouse Arts District Association is constructing 28 new, affordable artist studios within the skin of an existing industrial building at the ArtsXchange, a nearly three-acre property the organization acquired in 2014. Through public and private contributions, and over several phases, the WADA’s goal is to create affordable space for a variety of artists who might otherwise be priced out of the rapidly developing creative corridor. Doing so ensures that artists can continue to work in the district and contribute to the city’s overall economy. As we interviewed the artists who will be the first tenants at the ArtsXchange, we repeatedly heard how hungry they are for community. Without exception, they told us that they are drawn to an environment that invites interaction. The rental fees are substantially below market value, and the space includes areas that are conducive to community activities, conversations, performances, exhibitions, classes, and other gathering opportunities. It also allows us to expand our educational offerings to students of all ages. Leaders in the Warehouse Arts District Association are working with our neighbors and public officials to establish landscaping, lighting, sidewalks, signage, and other improvements throughout the community. One of our short-term goals is to open portions of the Pinellas Trail to pedestrians and bicyclists during St. Petersburg’s monthly Second Saturday ArtWalk. The project is transformational, converting blighted property into an inspirational art center and the Warehouse Arts District into a thriving and diverse economic, artistic, and entrepreneurial community. True, art is good for the soul. And as creatives throughout Tampa Bay are rapidly demonstrating, it is good for business. You may have walked past their Ripples of Life installation at the Florida Aquarium in Tampa or marveled at the towering Vertical Hum abstract structure at Metro Development in Rocky River. MGA Sculpture Studio has been around for more than 20 years, with 12 of those years in St. Petersburg and contributed to its public art as well as interior architectural decorations, installations and displays. The studio works in various materials, including glass, metal, wood and fiberglass. Owner Mark Aeling's work is widely recognized nationally and internationally and was included in the Stone Sculpture Triennale 2012, which took place in Japan. "MGA is primarily a commission driven sculpture studio," Aeling said, "I have a showroom that displays past work and samples of materials. This is helpful when talking through the creative process." The sculpture can be designed for a space or an idea, and the studio will work with the client to produce the final piece. Aeling picks the material for a project based on the subject. "Generally I would say that I like to work with whatever material best solves the challenges of the project at hand," he said, "I make a lot of site specific work that is commissioned. Often times I'm working with Developers, Architects or on public art commissions." Over 20 years, as his career had evolved, he finds that the process of choosing a sculpture to suit the space has changed. Earlier, clients would tell him the idea they had in mind and they would work together to achieve that vision. Now Aeling finds that clients come to him with space and ask him what would be suitable. The final result is still the product of collaboration, which Aeling finds a very satisfying way to work. The studio's portfolio covers a wide range, from public art and monuments to small projects, reliefs and architectural ornaments. Clients have included a wide range of public buildings from schools, academies and hospitals to zoos and aquariums to corporate buildings. MGA sculptures can be seen at Discovery Park, the Colorado Symphony, Six Flags and other diverse locations. Aeling has been a pioneering force in the St. Petersburg art community. He also co-owns the Soft Water Studios, which has space for a gallery and special events. "This would allow us to show our work as well as the artists who rented the other portions of the space," Aeling said, "We also bring in artists from around the community and around the country. Soft Water became the 'model home' so to speak for the ArtsXchange project developed by the Warehouse Arts District Association of which I'm the Board President." By Patrick Kelly writer and editor for 83 Degrees Media in the Tampa Bay region of Florida. New studio space is coming to St. Petersburg’s Warehouse Arts District and the community is invited to come take a peek at the progress on Thursday, April 27th. At a “Hard Hat Celebration” and fundraiser, the St. Pete Warehouse Art District Association will showcase the ArtsxChange, a project that converts 50,000 square feet of space into affordable art studios as part of the association’s commitment to the local art community. “It’s a chance to get people up to date on the project, which has been in the works for several years, let our sponsors and donors see where their money has gone and to really invite artists into the area to bear witness to our commitment to provide affordable space for them to create,” WADA Executive Director Mary Jane Park says. The event begins at 4:30 p.m. and includes art by incoming ArtsXchange artists, live music, food and drinks, remarks from St. Pete Mayor Rick Kriseman and more. The new studios, located at 515 22nd St. S, are currently under construction and attendees will have the opportunity to view progress. A $20 donation to WADA is suggested but the event is free to attend. WADA has branded the ArtsxChange as a resource for the city, local artists and the community by creating “sustainable and affordable art studios and educational space.” The first phase of development began in March and is expected to conclude in mid-summer. It includes a 1,500-square-foot community space for art exhibitions and educational programing as well as 28 studios. Smith and Associates CEO Bob Glaser says his business is sponsoring the ArtsxChange because it improves the community and adds opportunity for residents. “It’s going to bring a lot of positive change to the market place,” he says. For more information on the event, to register and to view a list of ArtsXchange sponsors visit WADA online. Mark Aeling, an award-winning artist from St. Petersburg, Florida, will create the first public art piece under the Norman Arts Council's "Norman Forward 1% for Art" program. The Norman Arts Council paired with the city of Norman to create the Norman Forward program in fall of 2015 to help improve the public facilities like libraries and recreational facilities through public art. The "Norman Forward 1% for Art" program receives one percent from the Norman public arts board budget, according to the Norman Arts Council. 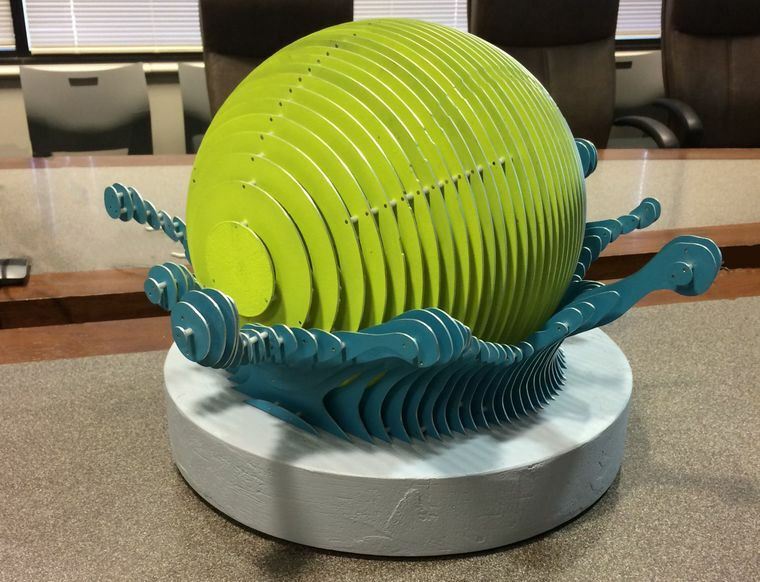 Aeling’s 20-foot sculpture titled "SPLASH" is the first public art piece as part of the program and will be installed at the renovated Westwood Recreational Complex and revealed this summer. "SPLASH" captures the interaction of the facility with its bold colors and design that match Norman’s vision of creating an exciting place for families to visit, according to the website. The project received a budget of $100,000 and sent out open call requests in the fall of 2016. The project received 155 applicants. The selection panel is composed of the City of Norman designee, a member of the Public Arts Board, Norman Arts Council board member, Ad HOC Committee member, the designer of the complex and local stakeholders. The board decided the three finalists, according to the Norman Arts Council. Erinn Gavaghan, executive director of the Norman Arts Council said the arts council is excited to announce this program. “NAC has been deliberate in developing an intensive, balanced process to amass the highest quality works that we can, and at the conclusion of this slate of Norman Forward 1% for Art projects, our community will have a diverse, impressive selection of public artworks for visitors and citizens to enjoy for generations to come,” Gavaghan said in a release. Aeling has "25 years of experience creating large scale, public art pieces. Past clients include the Florida Aquarium, Sea World, Six Flags, the St. Louis Zoo, Anheuser Busch and more," according to Norman Arts Council. For more information about "SPLASH" or the program, visit the Norman Arts Council website. Once the city’s designated manufacturing area known as the Dome Industrial District, the St. Petersburg’s Warehouse Arts District is transforming itself as an emerging eclectic community of working artists and small industrial shops. This is the place where “art is made.” It’s a popular stop on the trolley tour during the city’s Second Saturday Art Walk. An ever-growing number of painters, sculptures, glass artists, woodworkers and metalsmiths work and sometimes live in the neighborhood, which runs from 1st Avenue South to 10th Avenue South and 16th Street South to 31st Street South. In its heyday, the Deuces once housed more than 100 successful African-American-owned businesses, says Chuck Egerter, CEO of Eagle Datagistics and past President of the Deuces Live Main Street association. Landmark venues such as the Manhattan Casino, Dr. Carter G. Woodson Museum, the historic Mercy Hospital and the Royal Theater are also located here. Legendary African-American jazz and blues musicians like Louis Armstrong, Duke Ellington and Ray Charles, among others, played at the Manhattan Casino during the 1940s and ‘50s. A six-member committee with representatives from both districts has begun working with the city’s economic development team and two consulting firms -- Kisinger Camp & Associates, a Tampa engineering firm, and Community Solutions Group, a community planning consultant. Important infrastructure elements on the table for discussion include lighting, streetscape character, signage and wayfinding, as well as safety concerns and the need for bike lanes and sidewalks for pedestrians. Additional issues range from zoning and use of public open spaces to better accessibility and connection with the rest of downtown, especially the Grand Central District. A public kick-off for the project took place on November 30 followed by a trolley tour of the area the next day to give participants a close-up look at areas of concern or interest. In addition, an interactive website, was developed to allow users to leave comments and suggestions. At the end of January, the team will present their findings, initial design ideas and early implementation strategies during a series of community workshops held at the St. Petersburg College Midtown Campus. By early March, Casper expects the plan to be sufficiently “tweaked” to be ready for final presentation to the community, and then to go to city council for final approval. So far about $1 million has been set aside for the project, which Casper anticipates leveraging with grants and additional funding sources. “We aren’t talking about residential neighborhood improvements, but about uplifting and stabilizing the area and envisioning what it could become, especially with the confluence of economic, cultural and creative forces that are happening here,” says Pete Sechler, senior Director of Community Solutions Group. A critical piece of the plan involves the intersection of 22nd Street South and 5th Avenue South -- a key intersection that both Deuces Live Main Street and the Warehouse Arts District claim as part of their respective districts. The Pinellas Trail, a 47-mile linear park and recreational trail, runs diagonally through the intersection. The historic Seaboard Train Station, now the Morean Center for Clay, borders the trail and is just east of 5th Avenue South. Other nearby landmarks include Three Daughters Brewing, a popular hang out and local craft brewer, and the pop-up vintage Brocante Market. “5th Avenue South and 22nd Street South could be one of the coolest intersections in Florida,” says Sechler. Sechler points to obvious challenges to overcome, including overgrown yards, empty lots, chain link fences and lack of sidewalks and lighting on the Pinellas Trail. There are also breaks and disconnects between buildings and other structures that stop the flow of pedestrians and bicyclists, he says. Better signage, landscaping, sidewalks, lighting and wayfinding are definitely needed for the Warehouse Arts District, says Mary Jane Park, Executive Director of the Warehouse Arts District. Egerter presents an exciting vision of a rehabbed and transformed area that encompasses both the Warehouse Arts District and Deuces Live Main Street. For Deuces Live Main Street, it’s not only about improving the streetscape. There’s also the need to bring more opportunity and jobs to the area. The Warehouse Arts District is also looking at economic revitalization, but with a different focus -- making sure that improvements to the area don’t price artists out of the market, similar to what has taken place in areas like SoHo in New York and Wynwood in Miami, says Park. To make sure that doesn’t happen, in 2014, the Warehouse Arts District closed on 2.7 acres of land along 22nd Street South between 5th and 6th Avenue. The property includes about 50,000-square feet of warehouse space in six buildings. The goal is to turn the development into a collection of affordable studios and artist galleries called the Arts Xchange. Artist Mark Aeiling’s Mga Sculpture Studio is already located there. So is Soft Water Studios, the site of the old Soft Water Laundry, a former large commercial laundry that is now home to five artists, including painter Carrie Jadus. Phase 1 of the Arts Xchange project is currently underway, says Park. Some 30 small studios are expected to be ready for occupancy in June. Artists in a variety of mediums, from painters and poets to 3D and virtual realty, have already been interviewed and selected for the space.